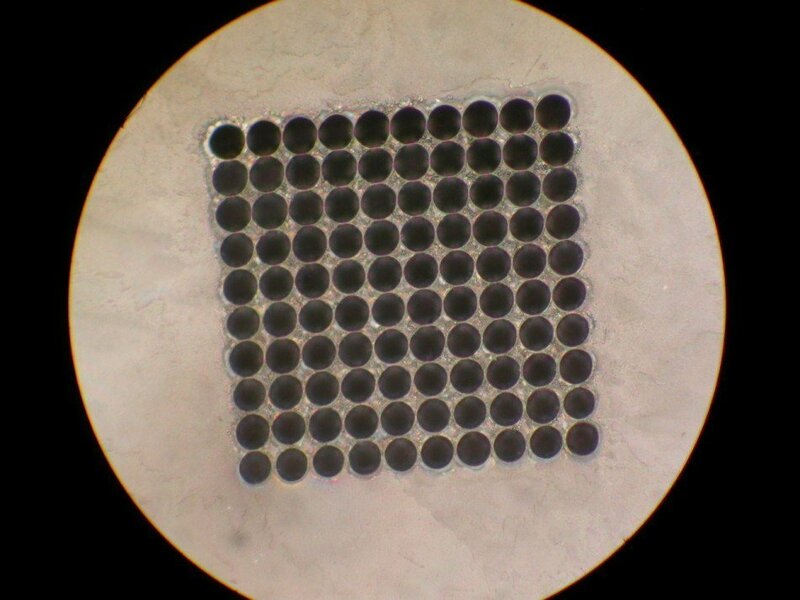 For this project, Precision MicroFab drilled a hole array in 500 μm thick borosilicate glass using an ArF excimer laser with a wavelength of 193 nm. Each hole had a diameter of 105 μm at the entrance of the hole, with a bottom diameter of 90 μm. The holes had flat bottoms and featured minimal taper and straight walls. The varying depths of the holes are due to different increments in the number of laser pulses, ranging from 500 pulses to 4500 pulses, at which point the laser breaks through the glass. In the top picture, showing the two dimensional array, the hole pitch was 120 μm with 5 μm interstitial spacing. This tight spacing demonstrates our ability to drill holes very close together without cracking or shattering the walls in between.